Boy dies on Schlitterbahn water slide – Welcome to Wyandotte Daily! 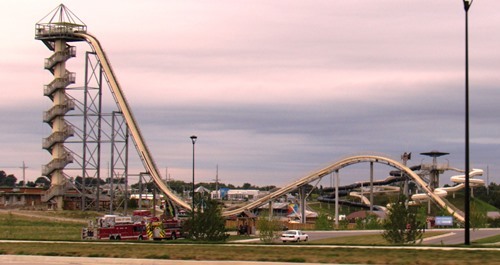 A boy died on the Verruckt water slide on Sunday afternoon, according to a statement from Schlitterbahn in Kansas City, Kan.
Kansas City, Kan., police, on social media, stated that they were investigating the apparent accidental death. The boy was identified as Caleb Thomas Schwab, son of State Rep. Scott Schwab of Olathe. “Michele and I want to thank the Olathe and Kansas City, Kan., communities and all our friends and family for their outpouring of support and compassion as it relates to the sudden loss of our son, Caleb Thomas Schwab. “Since the day he was born, he brought abundant joy to our family and all those who he came in contact with. As we try and mend our home with him no longer with us, we are comforted knowing he believed in his Savior, Jesus, and they are forever together now. We will see him another day.